The Fox Sports OTT platform and team received a massive workout this weekend, with the U.S. Open creating an opportunity for new services like Featured Tees coverage on the final day. Oh, and then there is that other event. The World Cup had an opening weekend that promises big numbers as it lowers work productivity of U.S. soccer fans across the country. William Aycock (left) and Clark Pierce have taken U.S. Open OTT efforts to a new level. He spent the weekend in the Fox Sports Go trailer at the U.S. Open at Long Island’s Shinnecock Hills Golf Club, where he and William Aycock, director of digital operations and distribution, were at the helm for streams of the actual broadcast as well as for channels offering four separate featured groups, a featured-holes channel, and the newly added featured-tee channel. Tested in earlier rounds, Featured Tees coverage focused on holes 4, 7, 11, and 14. Shots from locked off cameras behind the tee boxes were overlaid with graphics showing what clubs were in the player’s bag as well as TrackMan data, such as spin rate and launch angle, that typically does not make it to air. Analysts would do the deep dive into the data to help golf fans better understand the correlation between launch angle, ball spin rate, swing and ball speed, and where the ball lands. 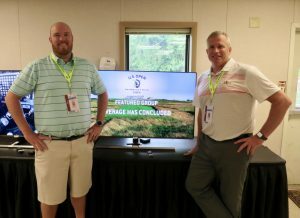 Featured Tees is an example of the opportunities Fox Sports is looking to take advantage of by leveraging the ton of data points gathered on a golf course as well as the dozens of cameras on the course. Fixed cameras are a better fit because they typically are free of the swish pans that may occur with a manned camera. The efforts at the World Cup, meanwhile, are taking advantage of feeds from Host Broadcast Services, which means that five bonus feeds are available per match as well as artificial intelligence in the form of IBM Watson. AI has been applied to more than 300 World Cup matches, and fans can visit the Highlight Machine at the Fox Sports Website and search the matches by year, team, player, match, or type of play (goals, saves, fouls, yellow cards). The system instantly whittles down the filters and creates a highlights package that fans can even share with friends. The full World Cup experience — offering stats, standings, schedules, and more — is found at the regular Fox Sports app, not Fox Sports Go. Pierce says the World Cup is occurring when Fox Sports is in the middle of a transition merging the two apps. The challenge is that layering in things like scores, stats, etc. weighs down the Fox Sports Go app. So that app is focused on authenticated TV services. A favorite is the feed, which begins two hours prior to every match and ranges from buses arriving to teams heading into the locker rooms, warmups, and beyond. It’s all part of giving soccer fans in the U.S. even more reasons to stay tuned to Fox Sports streaming coverage all day at the office. “From a daypart perspective,” says Pierce, “most of the matches are played during the week and working hours in the U.S., which is ideal for streaming. And viewers are responding. More than 4.2 million people visited various Fox Sports digital platforms on Day 2, a 77% increase from Day 1. Spain vs. Portugal, for example, attracted 819,000 unique viewers.